Bali Souvenior Shop Ashitaba specializes in basketry and handicraft, the shop selling handbags, basketries, containers and more, most products made from ata grass for good quality and in various designs and color. The original products of Ashitaba have best quality and all at reasonable prices that cannot be found in another place. 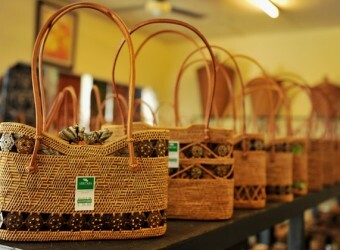 I would absolutely buy basket bag when coming to Bali. The tour guide recommended me to go to a famous shop, Ashitaba. Basket bags that are sold in Japan almost round shape but basket bags in Ashitaba have square shape and stylish. I had a good shopping here.